I made the decision partway through this month to stop writing every day, after having written daily for over a year. I was feeling burned out and utterly exhausted, and wanted my weekends back. I’m not making any commitments to keeping this writing pattern permanently, but for now, it’s a relief to have the weekends for myself and my family. I am a squeak away from reaching 80k on this draft of Never. I’m basically totally redrafting the last third, so it’s slower and harder going than the first two thirds. I’m at the point where I’m looking forward to this draft being done. Mostly so I can start editing it. I voted in the Hugos. Which translates mostly as slapping No Award on most of the categories. I’m looking forward to seeing the stats after the winners are announced, though I anticipate anger at the good works which got pushed off the ballot. One review written for the Australian Women Writers Challenge: Insert Title Here, edited by Tehani Wessley. One Netgalley review: Aurora by Kim Stanley Robinson. This has been a hard month health-wise, with many arthritis flares, as usual for me in winter. I’m coping, but the constant pain equals a lot of exhaustion. A head’s up that there’s a giveaway for Hear Me Roar, the anthology which features my story Broken Glass, over at Goodreads right now. Head over there to win a copy! I’m in the process of updating my site theme, so please excuse anything that’s broken or weird for the next few days. First, this is somewhat relevant to the panel I was on at Swancon about what makes a good short story, today’s daily writing kick from David Farland which discusses how to judge a story. And for anyone who’s trying to work their way up in the writing field, I can highly recommend subscribing to David Farland’s daily kicks emails. Second, something I actually meant to mention on that panel was Forever magazine, a reprint-only magazine recently launched by Neil Clarke (of Clarkesworld). I’ve been a long-time subscriber of Clarkesworld and subscribed to Forever when it first came out. And I have been utterly astonished at the brilliance of the stories that have been reprinted. You want to know what makes a good story? This is a really good place to start looking. It’s subscription-only, but cheap and in my opinion, worth the money. And third, I’d also like to recommend the new podcast by Mur Lafferty (of I Should Be Writing and the Shambling Guide books) and Matt Wallace – Ditch Diggers. I’ve listened to every episode of I Should Be Writing and highly recommend it for all writers (and especially beginning writers, it’s very worth getting access to the archives by supporting Mur on Patreon and listening to all the episodes). Ditch Diggers aims to explore writing as a business, and is highly entertaining besides. Kameron Hurley and Chuck Wendig have guested, and the latest episode has an interview with Brianna Wu. Go and listen and learn. Kisses by Clockwork now available! 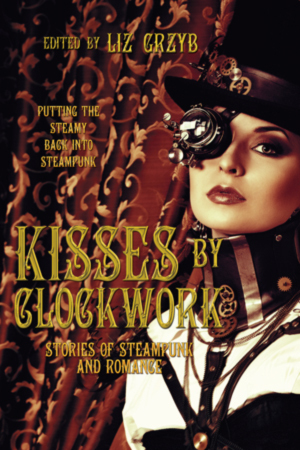 Kisses by Clockwork, the steampunk romance anthology which contains my story, Escapement, is now available! (ebook version is also coming soon). There is also a Goodreads giveaway for a copy currently running here. Today I had a migraine. Today I also went swimming. Today I am also on the (hopefully) tail end of a respiratory infection. Today I also went to the movies (though that was somewhat stymied by the fact that the cinema basically broke midway through the movie, resulting in many, many refunds and movie vouchers given out to patrons). Today, I also wrote just over 1,000 words. I’ve been frustrated at my general slowness as a writer a lot of late (and for “as late”, you can read too damn long – as anyone who gets to hear about me talking about writing will no doubt attest. I actually don’t have a problem getting words down, but one of the peculiarities of my process is that I find it very difficult to move forward with a story or novel if I know there are things that I need to fix in stuff I’ve already written. I don’t actually have a problem with doing that, but it makes me much slower that I’d like to be. The solution of course is that I just need to be generating new words on a project. I’ve tried doing a basic don’t break the chain thing, but for some reason that never gelled with me. I think the reason there is that I’d set a target – say 1,000 words – and then get frustrated at the odd day where I was too sick or busy to make that target, so breaking the chain. I’ve been listening to Mur Lafferty’s podcast I Should Be Writing for a long time. Like, I’ve actually invested many hours while walking listening to the podcast from the very beginning. I recommend it highly to all writers – both newbies and old hands. One of the things that Mur’s talked about for a long time about being key to her productivity is the Magic Spreadsheet (link to the google group and shared spreadsheet in there, as well as link to the podcast talking about it). I’d kind of shrugged it off for ages, thinking it was just another don’t break the chain thing. Then, exactly two weeks ago, I thought, I might as well give it a go. It’s pretty simple – you write at least 250 words a day, and you get points for word counts and consistency. I’ve written every day for the last 14 days. I’ve written just over 30k in that time. Weekdays, I’m trying to reach 2.5k, dropping back to 1k for the weekends, but just knowing that I’ll still get points if I write just 250 words is kind of awesome. I’m also making a concerted effort to work on just one project – at the moment, it’s the first draft of Never, after which I’m going to spend a little time working on some short stories and maybe some outlining. If I can keep working this way, I’m going to actually be able to finish this draft in a timely manner. I’m kind of feeling like I’m levelling up as a writer right now, and it’s kind of awesome.